The Federal Authority for Nuclear Regulation (FANR), the nuclear regulator in the UAE, has been awarded the ISO 9001:2015 certification for Quality Management System, in the field of the regulation and management of services related to the country's nuclear sector. These include licensing, compliance, monitoring for safety, security, safeguards and radiation protection, and the provision of services related to the radiation protection infrastructure, said a statement from FANR. It ensures that an organisation demonstrates its effectiveness and ability to improve services that meet customer and applicable statutory and regulatory requirements, and aims to enhance customer satisfaction through the effective application of the system including processes improvement, it added. The Federal Authority built its own Integrated Management System (IMS) based on the International Atomic Energy Agency (IAEA) safety requirements on Leadership and Management for Safety which is a dedicated management standard for nuclear organisations. 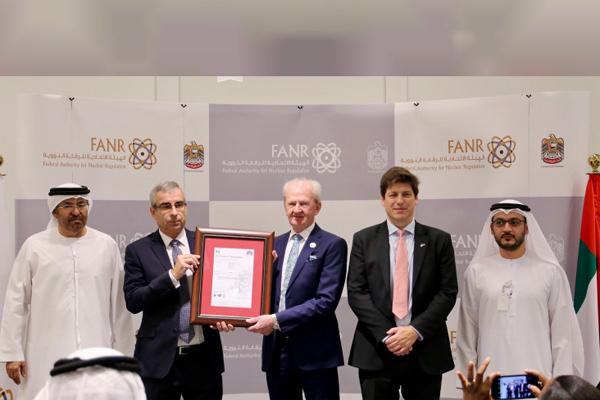 The certification was awarded at a ceremony in the presence of FANR’s Chairman Abdulla Nasser Al Suwaidi, British Ambassador Patrick Moody, and members of the Board of Management of the FANR and representatives of the British Standards institution. "This is a demonstration of FANR’s efforts towards excellence and quality, which is necessary to achieve our vision in becoming one of the leading nuclear regulator globally as well as ensuring the protection of the people and the environment," remarked Christer Viktorsson, FANR Director-General. Since its start in 2009, FANR has in place its IMS to document its work streams by detailing all the processes and procedures, being its core, support, or management processes.